Antidote for the winter blahs: garden color! Winter offers a breathing space for the garden and gardener, but when for days on end the sun never shines, some bright spots of color do wonders to lift the drabness of the winter garden. Now is a good time to see where your garden is lacking in winter interest and to add some year-round stars to perk things up. Winter-blooming flowers carry forward the beauty and complexion of the garden as fall fades into winter. Fortunately, there are numerous varieties. Helleborus: From mid- to late winter, hellebores produce beautiful bell-shaped flowers in a wide variety of colors, including white, green, pink, red, purple and mahogany. 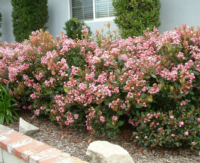 These plants are also appreciated for their attractive foliage and because they are deer resistant. Plant in partial or full shade in good, well-drained soil amended with plenty of organic matter. 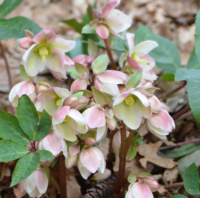 Helleborus niger, also known as Christmas Rose, and Helleborus orientalis (Lenten Rose), both popular cultivars of this plant, thrive in many Marin gardens. Rhododendron: Several varieties of rhododendron add color to the winter garden from Christmas until late February. Rhododendron 'Christmas Cheer' (tight trusses of pink to white flowers) and Rhododendron 'Rosamundi' (pink) are two excellent large leafed cultivars. Two Belgian Indica hybrid azaleas, 'Albert and Elizabeth' (white with pink edges) and 'Paul Schame' (salmon), both profuse bloomers with lush foliage and large semi-double or double blossoms, do well where temperatures don't fall below 20 degrees. For best results, plant in well-drained soil in an area with morning sun and afternoon shade. Camellia: Camellias provide beautiful, showy blossoms as early as October and as late as May. 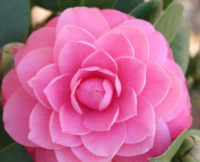 The most well-known camellia, Camellia japonica, is a favorite of many California gardeners. Among the many named winter-blooming varieties of this popular cultivar are 'Daikagura,' 'Debutante,' and 'Elegans,' all of which produce blossoms in various shades of pink. 'Silver Waves' and 'Alba Plena' bear double white flowers; 'Tom Knudson' and 'Tomorrow,' large red flowers, and 'Wildfire,' semi-double orange red flowers. Camellia oleifera, the hardiest of all camellia species, produces small, fragrant white or cream flowers in autumn and early winter. Camellias grow better and bear more attractive flowers if grown in well-drained, amended, slightly acidic soil in partial shade. For the best results, protect blossoms from wind and rain. Cyclamen: Cyclamen persicum, known commonly as poor man's orchid, bears showy lavender, pink, purple, red, salmon or white flowers from fall into spring. The flowers, suitable as cut flowers, are carried above a clump of attractive, heart-shaped, basal leaves, many with silver mottling. Cyclamen prefer partial shade or partial sun and a fairly rich, porous soil, which has been amended with lots of organic matter. Protect plants from snails and slugs. Clivia: Clivia miniata produces brilliant large clusters of funnel-shaped orange flowers from early winter to late spring. Flowers appear on stalks, which rise above dense clumps of dark green, strap-shaped leaves. These beautiful plants do best when planted in groups in shaded areas of the garden. As clivias are damaged by freezing temperatures and survive only to 25 degrees, plant them in a well-protected, shaded area of the garden. Rhaphiolepis: Rhaphiolepis indica, Indian hawthorn, is a profuse bloomer that bears fragrant, showy white to nearly red flowers from late fall to mid-winter. Plant in full sun. Clematis: Two evergreen clematis, Clematis cirrhosa 'Wisley Cream' and Clematis 'Freckles' reliably bring forth cream-colored, small, bell-shaped flowers all winter into spring. Clematis cirrhosa 'Wisley Cream' was selected in 2002 to receive the Royal Horticultural Society's Award of Merit, which is given to recognize outstanding garden plants. Clematis require excellent drainage and a sunny, sheltered position that is protected from the wind. Ribes: A California native, Ribes speciosum (fuchsia flowering gooseberry) is treasured, despite its thorny stems, for its deep crimson to cherry red flowers, which last from winter into spring. Ribes sanguineum (pink winter currant), also native to California, produces drooping 2- to 4-inch clusters of 10 to 30 small, deep pink to red flowers. Plant in well-drained soil in full sun or partial shade.